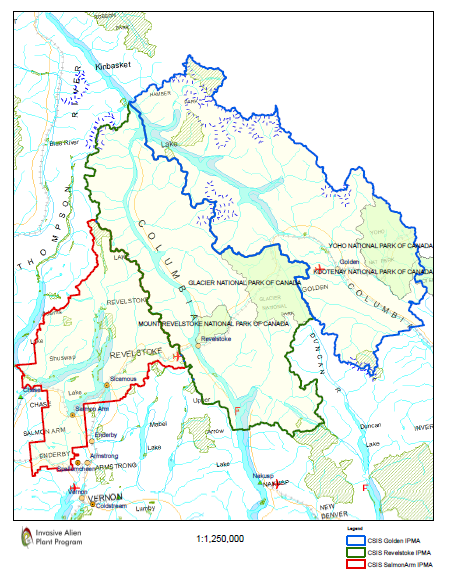 This fall, the Columbia Shuswap Invasive Species Society (CSISS) will be hosting a series of operational planning meetings for each Invasive Plant Management Area (IPMA) within the Columbia Shuswap Region (see map below). The intention for the meetings is to facilitate a collaborative, cooperative approach to invasive plant management that reflects shared priorities between land management agencies. These operational plans will identify priority invasive plant species in each area and their management objectives. The meeting objectives are to: 1) identify missing background information for each IPMA and 2) collectively prioritize species and activities for invasive plant treatments, inventories and monitoring. If you would like to find out more information about these meetings please contact the CSISS Program coordinator at csinvasives(at)gmail.com.